Jake Maurer will surely remember Saturday October 15, 2011. 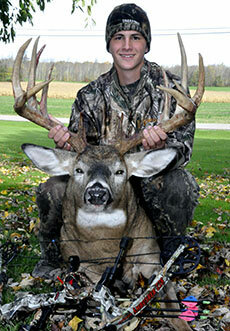 The 17-year-old bowhunter from Bergen, New York took a massive 17-point buck on opening day of the 2011 archery season. Jake was hunting alone in Genesee County in the evening when the massive 17-point buck first appeared. The hunting conditions were less than ideal, but the buck worked its way in, offering Jake a 20 yard shot. After the shot, Jake retrieved his arrow and headed home to get some help tracking the deer. He returned with his father and a friend. After following the buck's trail for 80 yards, Jake walked up on his buck and placed his hands on the antlers for the first time. The buck has a main frame 10 point rack with 7 extra points and carries its mass throughout its antlers. The buck is sure to make the NYS Trophy books and is a great deer for New York. Congratulations are in order for Jake on his 17-point buck!